I am going to mainly try to write an essay visually with images to link the entire shape elements together. 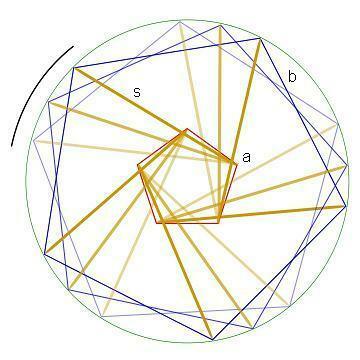 This is a tension tensegrity circle with a variety of overlapping compression elements in yellow creating a pentagon in the middle. In the next diagram blue colored background below, the straight portions of tension have been reconfigured into arcs to maintain the tension. 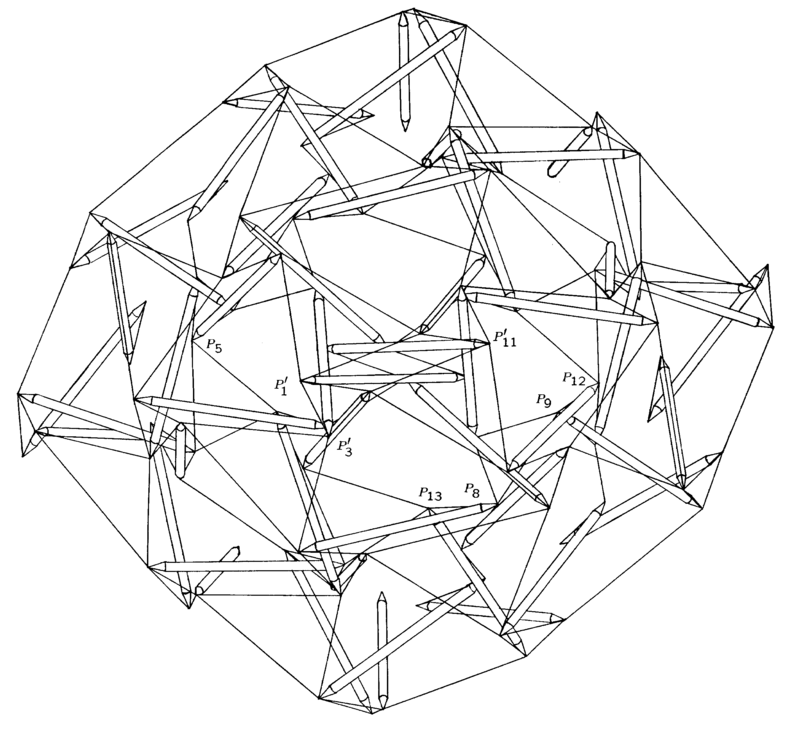 In the last line drawing at the bottom, the tensegrity diagram connects to circles that are more open in their outline dimension but there is more detail within their connected arrangements between groupings. If we continue along this line of reasoning the patterns of attachments become the connection lines within an entire structure. What if you decide to match the brain slices that can be seen from a macaque monkey, which are representations of real brain circuits then ask an engineer from IBM to design a circuit based on the monkey brain circuits, what sort of overall shape might be achieved that links the connections within this orientation ? Such a project has actually taken place. The task is enormously daunting since billions of connections are required to link all of them together into a patterns of coherency and compactness, given the limitations of the size scale of the computer chip. So what kind of linking shapes match this kind of connectivity? I think it is apparent that a floating tension appearance seems to rise from the data points rising Phoenix style. 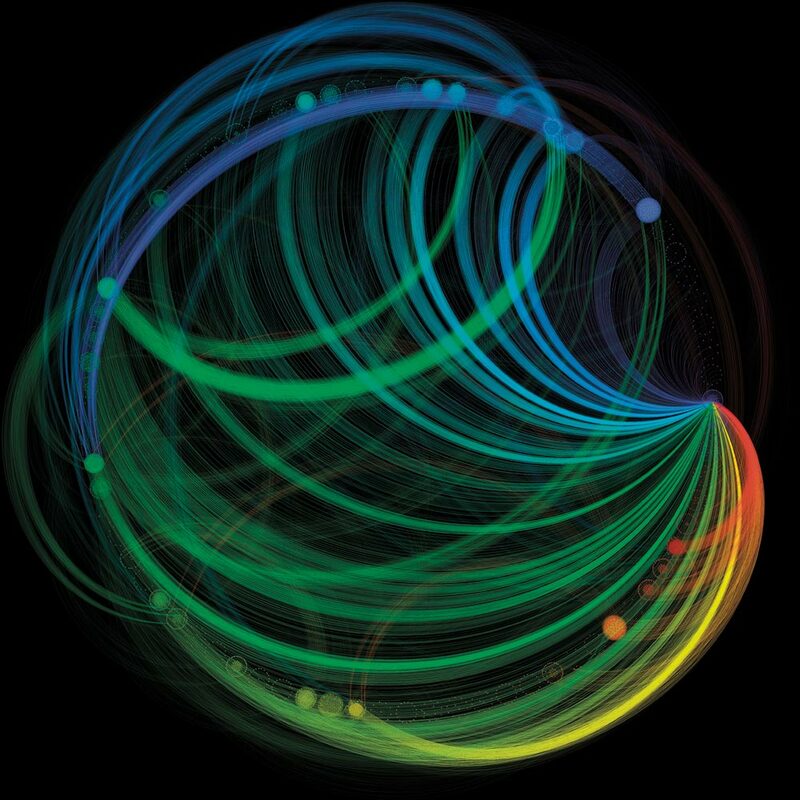 Image designed by Emmett McQuinn, IBM. “Over the past 2 years, IBM’s cognitive computing group in San Jose, California, has made great strides toward designing a computer that can detect patterns, plan responses, and learn from its mistakes, says Emmett McQuinn, a hardware engineer at IBM who designed the image. In 2011, the company demonstrated a new kind of computer chip, based on neural circuitry, that combines memory and computational processing for nimbler problem-solving in areas where traditional computers fall short, such as pattern recognition. Then, the company used data from studies of macaque brains to see how those “neurons” should link up, and simulated neural networks with billions of neurons and trillions of axons and synapses. What I find fascinating about this IBM accomplishment is that the engineers did not have a design format then forced the data points to fit that format. Instead by simulating and mimicking the actual neural template from a macaque brain which appears to be shaped as a floating tension global network. The coherence within a floating tension network is based on a mathematical assembly of equations that can satisfy both the design of the final fit but the improved connectedness that such a circuit has for performance output in their overall objective, toward better thinking ability on the computer chip. Now appreciate that Nature does this within our own brain that is both elastic in nature and elastic in capacity, capable by reconfiguring itself, dynamically all the time. We are alive within our own brain circles of tension in a floating network capable of handling the billions of data points streaming within our arcs of neural connections. 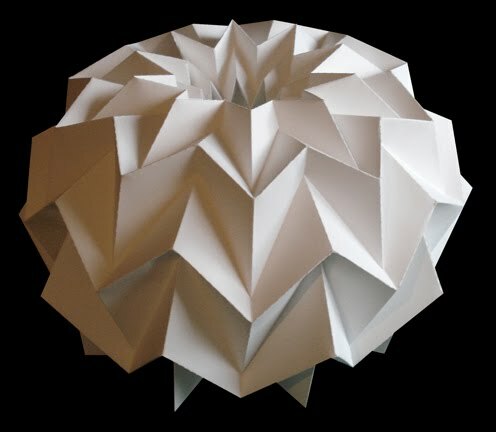 My final image is of folded paper based on tensegrity folding patterns on the outside shape of the appearance that we are most familiar with, a stylized Picasso cubic version of our own cortical brain surface. That is the beauty of floating tension networks which are capable of establishing tensegrity arcs as internal links with an overall floating tension external shape. 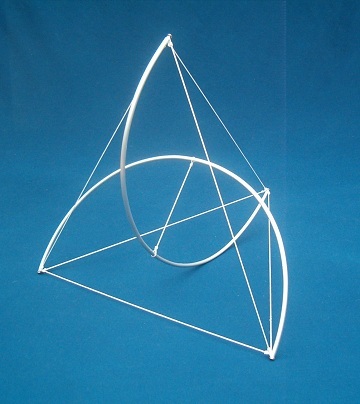 Tensegrity as floating tension exists locally in the design integration merging into interacting globally in the total coherence of the entire dynamic surface. Shape tension/compression is signalling, and cells are organized around shape sensing, that is how we think.